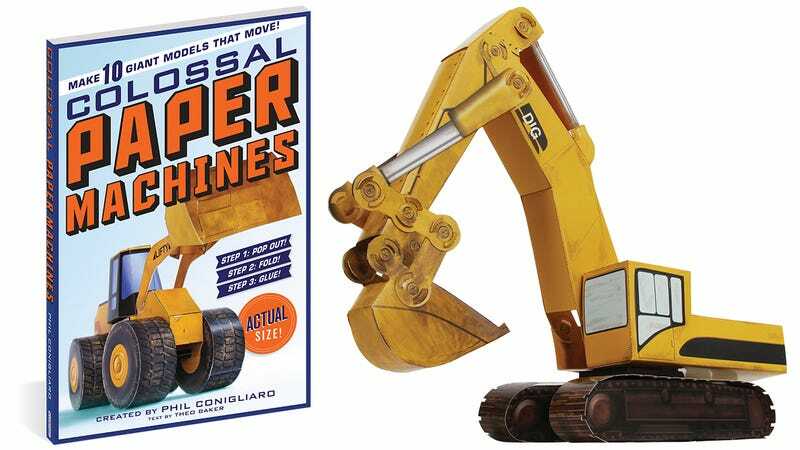 The words “some assembly required” often strike fear into parents when they’ve bought their kid a new toy, but that’s half the fun with Phil Conigliaro’s new book called Colossal Paper Machines. The 128 pages of the massive tome are filled with pre-cut, punch-out paper parts that can be folded, glued, and assembled into ten different toy models. The book includes everything from a giant firetruck, to a double-rotor Chinook helicopter, to the Space Shuttle. And although they’re all made out of paper, each model has moving parts like wheels that roll on the cement mixer, a moving arm on the excavator, and a giant spinning paddlewheel on the steamboat.